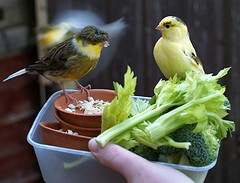 2 Pet Canary Birds Enjoying Greens and Egg-Food. 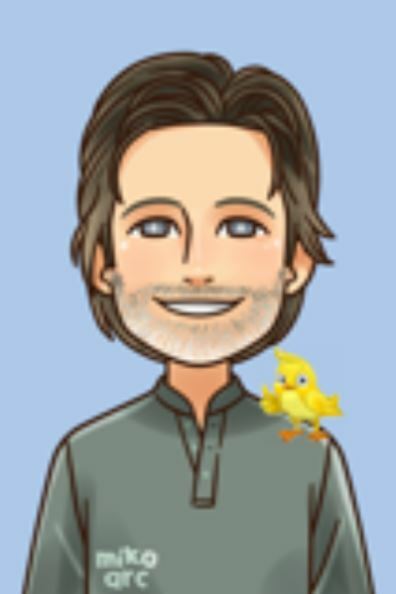 Regarding your recent issue of CanaryTips, I do not have "A" messy canary - I have "TWO" messy canaries. They are 2 boys. They do fight from time to time and there is a lot of posturing and activity but without any bodily contact. I do have another cage and if things got out of hand, I would move one of them. They both sing - one better than the other. They are 2 happy little birds and I love them. The mess they make does not worry me. I feed them well - seed, egg-food when molting, which they both love, and dandelion leaves which are very acceptable to them. Also lettuce leaves and apple. I do not use any form of weed-killer or sprays in my garden so when dandelions grow in my lawn I manage to save enough young leaves for the 2 boys. They go by the names of Uriol and Raffael, known to friends and family as Uri and Raffi. One one occasion, Uri escaped from the cage and I could not catch him. Raffi was going mad in the cage and at one stage was trying to pull Uri back in through the bars of the cage by his tail feathers. Eventually I gave up, left the door of the cage open, and Uri found his own way back, much to the relief of Raffi. Almost everyone loves pets thanks for sharing and by the way you have named them well. Could you please keep sharing their pics. My canary, Willie, is about 6 years old. He is very healthy and still sings like Mario Lanza. For the last 8 months we have noticed how fast his beak is growing on the top half of the beak. We trim it now about every 2 weeks. Is this just an indication of older age or is there something else involved? He has a cuttlebone in the cage but don't see him using it. I read that two males in a single cage will probably not sing. The article told how you should have separate cages and they should be at least 6 feet apart. Were your boys raised in the same cage or are they related? I would like to know if they sing a lot. I have one male canary and he sure does sing but wondered about two in a cage. Excellent comment and question. Thanks. I get emails ALL THE TIME from canary owners wondering why their canary has suddenly stopped singing only to read later in the email that they recently added a 2nd canary to the cage. It is true that 2 canaries in a small cage will usually not sing. A canary can be territorial and if another canary is "too close for comfort" he may be afraid to sing. Then when the two birds are separated into 2 different cages, the singing starts again. The "6-feet" rule is can be bent. Some canary birds will begin to sing again even if the cages are placed right next to each other. You would just have to experiment with the distance to find out where the two canaries feel comfortable.